If you’ve never shopped downtown Kerrville before, you’ll find our local merchants have much to offer. Shopping in downtown is an ideal combination of unique and savvy, the latest trends, and vintage items. Included here is a list of some of downtown’s best stores and shops, and we encourage our guests to discover downtown Kerrville and all it has to offer. First, browse gifts, housewares, and specialty items at Crickets and Hill Country Living. Schreiner’s Store offers designer label clothing and handmade items, while Ravished by Design carries fun fashion, lingerie, and bath and body selections. LuluBelle’s Pirates & Pretties stocks clothing, toys, books, and more for children, while Bohéme Nouveau offers creative handmade items, along with an art studio inside just for kids! For the finest jewelry, a visit to Jim Morris Designer, Inc. and Baublit’s Jewelry is a must. Book lovers will find a haven at Wolfmueller’s Books, while the Fairy Moon Emporium features an eclectic selection of handcrafted textiles, art, unique home goods, and more. 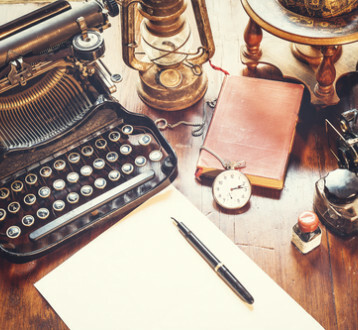 Lastly, collectors and antique aficionados will want to check out the Sunrise Antique Mall, Estate Antiques, and Fitch Estate Sales for those vintage and hard-to-find relics and curios. Many of the Hill Country’s finest treasures consist of a collection of historic, interesting and unique towns, all of which offer our visitors a fun, fascinating experience, along with some of the country’s most magnificent natural scenery. From Luckenbach to Boerne, New Braufels to Blanco, Kerrville to Fredericksburg - just take off on almost any of our area’s two-lane roads and, before you know it, you’ll be up to your ears in rustic, small-town charm. Depending on the time of year, you’ll enjoy stunning views of farm country, sparkling rivers, or an abundant assortment of wildflowers. The events and activities will vary, and you can either seek out what you like, or go with the flow and make it a true adventure. Go two-stepping and boot-scooting at the dance halls of Kerrville or Luckenbach, hunt for topaz in Mason County, climb Enchanted Rock, hike to Gorman Falls, or just enjoy the view from the comfort of your car during the stretch of highway between Kerrville and Medina. No matter which direction you choose, if you’re in the Hill County, you’re always in the right place. 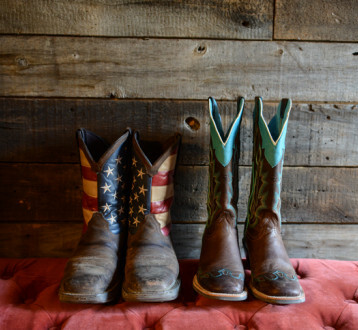 If there’s one thing Texans know all about, other than barbecue, hats, and two-stepping, of course, it’s cowboy boots. That’s why you’ll hear so many folks talk about “The Boot Whisperer.” This sounds like one of Texas’ bigger-than-life legends, but she actually exists and is located only a quick day trip away in Wimberley, Texas. Located about an hour and a half drive from here, Wimberley is surrounded by Lady Bird Johnson’s wildflower region, and over the years has become a popular location for retirees, as well as a retreat for writers, musicians, and artists. It’s also home to the Wild West Store, and to Ulli Johnson, known as “The Boot Whisperer.” Satisfied shoppers swear her knack for selecting just the right boots for them after only a glance or two at their bare feet is more than a gift – it’s genuine magic. With over 500 pairs of boots in stock, and Ulli’s assistance, you’re sure to find a great pair of boots that fit you better than Cinderella’s slipper. Along with boots, the shop carries western goods and collectibles, including saddles, chaps, hats, and more. Currently open by appointment only, so call (512) 847-1219 before you hit the road. Texans love Texas, but they are especially devoted to the Hill Country. Part of the reason is that the Hill Country offers so-gorgeous-it’s-almost-unbelievable natural scenery – so much so that the Hill Country has been named a #1 summer destination by the New York Times. Additionally, we offer a plethora of fun and fascinating attractions and activities, and we’re some pretty darn friendly folks. Ya’ll know we are the biggest fans of Kerrville, but we also have to give kudos to some of the towns in the surrounding area. Here are just two of our favorites for short visits, or for day trips. First, check out the uniquely German heritage of Fredericksburg. Even though it’s in Texas, this town retains the cultural heritage of its founders, and offers visitors a German small-town vibe, along with some of the regions best food, wine, and fun times. Next, step out one evening for two-stepping at the Gruene Dance Hall. Located just outside of San Antonio in the Gruene Historic District, it’s one of the oldest and most famous dance halls in the state and features some of the best live music. 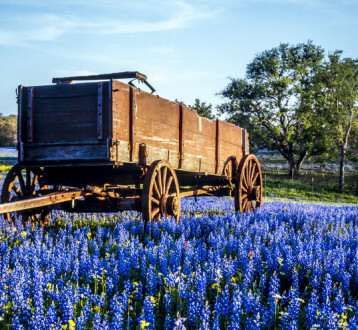 Long before Spanish priests gathered and planted bluebonnet seeds around their missions, this exquisite blue flower, native to Texas, was a hardy perennial that bloomed every year, and to this day the sight of masses of bluebonnets continue to captivate tourists and locals alike. This colorful wildflower has become a symbol of the state, and many road trips are taken with no other reason than to see fields and valleys full of bright blue blooms. 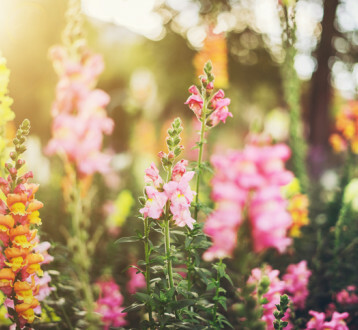 Although there is also a pink bluebonnet, they are seldom seen, and most of the blooms are blue. There are many legends associated with the bluebonnet, and perhaps the most popular one is that the rare pink bluebonnets are found near the San Antonio River, within sight of the Alamo, and that their color represents the blood that was shed by those who died in the battle for Texas’ independence. To see the bluebonnets in all their glory, you’ll need to plan your visit. Although the Hill Country is chock full of lovely flora at all times of the year, bluebonnets bloom only for a short time in the spring – anywhere between two-four weeks. Lovers of symphonic music in Texas’ Hill Country couldn’t ask for more than the Symphony of the Hills. Dr. Eugene Dowdy (Conductor and Artistic Director), Concertmaster Dr. Daniel Kobialka, and the Symphony’s 75 musicians are accomplished and gifted professionals, having performed from an abundant repertoire encompassing all musical boundaries. Each Symphony of the Hills season includes four classical concerts, one Pops concert, and two free concerts for thousands of young students and their teachers. One of their primary goals is to nurture budding musical talents of students, as well as broaden music appreciation for all. Each year, Symphony performers teach, coach, and mentor hundreds of children and adults throughout the area. Symphony performers include Schreiner University students and faculty, along with other professional regional performers. Along with the concrete and measurable benefits of music appreciation and tutoring, the intrinsic value of the Symphony of the Hills is immeasurable, as cultural community organizations not only benefit the area’s residents but also attract new businesses and citizens. Concerts are performed in Kerrville’s Cailloux Theater for the Performing Arts. Sometimes, you need a good road trip – not too far, just enough to take in some scenery and some sights before heading back. With that in mind, we’ve listed some Texas Hill Country attractions we think everyone should visit, and all of them are no more than the reasonable distance of an hour-and-a-half’s drive from Kerrville. First, treat the family to a day at Schlitterbahn New Braunfels. This world-famous waterpark is close enough so that everyone can have a full day of fun, and still get back to the hotel in time for dinner and a good night’s sleep. If you’re feeling a bit hungry while on the road, check out the Grand Central Café in Kingsland. All-out horror fans will notice immediately that this is the infamous “Texas Chainsaw Massacre House,” that was taken apart after the film wrapped, then relocated and reassembled here. Hard-core fans will also recognize the same interiors that were used in the movie, but the only denizens here are the staff serving “Leatherface Lemon" cocktails to happy customers. Closer to Kerrville, there’s another interesting stop: the tiny town of Luckenbach, where you’ll find a cotton gin, a post office, a blacksmith shop, and a dance hall. Home to about 430 species of our feathered friends, the Hill Country offers both expert birders and bird watching “newbies” a rich and fulfilling experience. Of special interest to these groups is the fact that two of these, the Black-capped Vireo and the Golden-cheeked Warbler, are on the endangered species list. Since they are so well protected, it’s often difficult to get a gander at these tiny creatures; making these sightings especially rewarding. Many Hill Country birding sites offer traditional birding blinds, enclosed shelters, and observation platforms for the comfort and convenience of our birder buddies, such as the Live Oak Wilderness nature trail in Lady Bird Johnson Municipal Park in nearby Fredericksburg. You’ll find the park itself is prime bird-watching territory, including the yellow-crowned night heron, MacGillivray's warbler, the zone-tailed hawk, and other rarer species. Aside from the multitude of birds, you can also get up close and personal looks at many different species of dragonflies, butterflies, damselflies, trees, and wildflowers. Every place in the world has its share of alleged ghosts and spooky legends and stories about them, and the Texas Hill Country is no exception. If you want to check it out, we even have a few ghosts right here in Kerrville. The Kerr County courthouse was allegedly the site of a murder-suicide, and many folks claim to still hear the unlucky couple arguing. Upstairs at the jail, there are reports of phantom banging on the steel bars and sounds of keys turning in the lock attributed to a prisoner who died in custody. Camp Verde’s Army Camel Corps experiments with camels as pack animals were unsuccessful and phased out. However, some report seeing a ghostly line of camels near the old fort, just outside of Kerrville, as well as phantom troops. Then, there’s “Ruthie,” a long-deceased customer of the Camp Verde store, who rifles the cash drawers, rearranges pictures, and, when really fired up, throws merchandise. Lastly, students and visitors at Schreiner University’s Delaney Hall have felt cold spots, and have witnessed lights, radios, and televisions turn on and off by themselves due to the ghosts from a mid-century suicide and accidental death. Stargazer alert - the stars at night really are big and bright right here in Texas, particularly at one of our most popular and mystical landmarks. Designated a Dark Sky Park and awarded “Gold-tier” night sky status by the International Dark Sky Association, Enchanted Rock State Natural Area offers optimal views of the night sky. Located just north of Fredericksburg, Texas, it has become a preferred place for budding astronomers and committed star watchers all across the region, and has hosted stargazing parties for visitors since 2011. As dark light decreases due to increasing light pollution, Enchanted Rock has become a stargazer’s dream, with a view so clear that the Milky Way is clearly visible. Although artificial light remains essential, it’s astonishing and alarming that about 80 percent of people have never seen the Milky Way or many of our other nearby constellations. In addition to watching the night skies, other activities that can be enjoyed by Enchanted Rock visitors are hiking, rock climbing, caving, and the ever-popular picnicking. Stargazers should also remember to stay hydrated, and bring along necessary food and drink. To make reservations for your own Enchanted Rock adventure, call us at (800) 292-5690. Beautiful gemstones, silver, and gold, combined with quality craftsmanship and distinctive design. These are the hallmarks of James Avery’s jewelry empire. From a single storefront in Kerrville, Texas in 1954, he soon opened stores in Dallas, Houston, and right here in San Antonio. The house that Avery built thrives yet today, with five manufacturing plants across the state, and 50 company-owned-and-operated stores across the Southeast and Midwest. Also known for religious themes in his designs, Avery was commissioned in 1987 by the Archdiocese of San Antonio to design and create four vessels that would be used by Pope John Paul II when performing Mass while visiting here. Avery was named San Antonio Entrepreneur of the Year in 1988, and his wife Estela is the executive director of the San Antonio River Foundation. With 1,100 designs and 14,000 unique pieces sold at other retail outlets, such as Dillard’s, in 28 states, the company grosses millions of dollars annually. Sadly, James Avery has since passed on, but his genius and creative spirit will continue to live on. Whether you’re a slick boot scooter or a virtuoso of the Texas two-step, the Hill Country offers a variety of dance halls, and we’ve listed some of the best here. 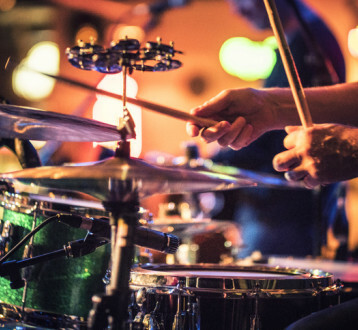 First, check us out – we’re proud to have the only dance hall in Kerrville, so you can walk over and cut a rug to the music of live local bands every Friday and Saturday night. Additional locations less than an hour away include Arky Blue's Silver Dollar Saloon in Bandera and the famous location of Luckenbach, where the dancehall features the finest in Texas country entertainment every weekend. Kendalia Halle in Kendalia often hosts favorites such as Gary P. Nunn. The final two on the list have a travel time of 1 ½ hours but are considered worth it. John T. Floore’s Country Store in Helotes has hosted such luminaries as Hank Williams Sr., Patsy Cline, and Elvis Presley himself, and remains one of the state’s prime venues for country music. Lastly, Gruene Hall in Gruene is considered the oldest dancehall in Texas and attracts the finest performers, who are happy to perform in the same location that helped launch the careers of George Strait and Lyle Lovett. Throughout the history of Texas, its residents have written songs about them, barbecued them, adopted them as pets, gotten tattoos depicting them, and, way back in 1927, even made them the small state mammal. Although their shells have often been put to utilitarian use, it took Charles Apelt to add a mass-production flair to this trend. The nearby town of Comfort, Texas was the choice of 15-year-old Charles Apelt, a German immigrant who conceive the idea of the Apelt Armadillo Farm. Apelt’s experience in basket-making would serve him well when he noted that the animal’s armored shell would make a practically indestructible basket. He began an armadillo basket factory in 1898 and produced around 40,000 baskets within a period of six years that were sold and shipped worldwide. Additional products followed, including floor lamps, table lamps, wall fixtures and banners, ladies purses, and smoker’s stands. Today, the Apelt armadillo farm still remains on the outskirts of Comfort but is no longer a manufacturer of armadillo products. Guests can visit the nearby Armadillo Haus Museum and General Store for a look at artifacts from the farm’s restoration. “Making God Laugh,” “Nunsense,” “A Super Groovy Night’s Dream,” “Dorothy in Wonderland,” and a variety of annual seasonal and holiday performances are only a few of the theatrical treats waiting for you at Kerrville’s Playhouse 2000. Renowned as one of the best live theater venues in the Hill Country, Playhouse 2000 is the result of a dream by Doug and Susan Balentine in 1998. The couple, who between them possessed about 60 years worth of managing, directing, and teaching in Kerrville’s thriving arts community, particularly wanted to establish a safe and educational haven for the region’s “at-risk” youth and children. Doug has since passed away, but he also scored and wrote more than 50 original productions during his tenure at the Playhouse. The couple’s goal to provide comprehensive theatrical learning experiences via guided acting classes and onstage experience in theatrical productions for area youth and others has proven to be a resounding success, as Playhouse 2000 is well know for their annual Youth Shakespeare Festival, in addition to an annual summer children’s workshop that ends with a live performance. For more information about Playhouse 2000, or for tickets, click here. For savvy shoppers of collectibles and antiques, the Sunrise Antique Mall in downtown Kerrville is one of the best places to find it all. With over 20,000 square feet of shopping, this multi-vendor mall is truly a collector’s haven. You’ll find vintage kitchen wares and household tools, glassware, posters and pop culture items, lovely antique furniture and framed art, rare stamps, old road signs, books, and Texas wildflower jellies, salsas, and barbecue sauces, and, for the vinyl aficionados, a 4,000+ record collection. The Sunrise Antique Mall is an ideal place to get an early start on a holiday gift list, find that perfect item for a friend or family member, or to augment or even complete a favorite collection of vintage items. Be prepared to stay a spell – the mall is so enticing that you can easily lose yourself for hours at a time. For more information, call (830) 895-2414, or click here. Texas’ Hill Country features a huge selection of events, attractions, and entertainment for its visitors, along with lots of family-friendly fun and plenty of opportunities for selfies and other photos. For those who want to be the envy of their Instagram feed, here are four of the best places that will provide the perfect backgrounds for your pics and poses. First, check out the fabulous Schreiner Mansion in the heart of downtown Kerrville. Built in 1879, this beautiful historic building is also listed on the National Register of Historic Places. Next, the Museum of Western Art is a fascinating way to spend some time, and their large outdoor sculptures are ideal backdrops for cool selfies. Don’t miss a visit to Enchanted Rock in Fredericksburg for a photo with this historic and, considered mystical by many, attraction. Lastly, for a truly unique photo op, don’t miss a visit to nearby Ingram’s Stonehenge II and Easter Island Heads. The site remains under the auspices of the Hill Country Arts Foundation and the tour is easily self-guided. Now, everyone say cheese! Whether it’s a lone guitar player, or a big, Texas-style band, the Texas Hill Country has always been a mecca for some of the country’s most talented musical artists. Some of the finest musicians in the nation are native Texans and are proud to entertain here on a regular basis. Also, the region plays host to an abundance of music, folk music, and singer-songwriter festivals annually. Thousands of visitors flock to Kerrville, Luckenbach, Fredericksburg, and the surrounding areas to hear such artists as Waylon Jennings, Willie Nelson, Lyle Lovett, Steve Earle, Lucinda Williams, Kathy Mattea, Townes Van Zandt, Guy Clark, Los Texmaniacs, and The Accidentals. However, popular as country and western is, the area has a diverse range of music and venues for all tastes. From cowboy bars and saloons to swanky clubs and theaters, to coffeehouses and outdoor arenas, to the pub and dance hall here at the Inn, the Hill Country sways to many beats. Traditional German and country, western swing, classical, bluegrass, Americana, and jazz can all be found here. So, if you’re a music lover, stop in and stay awhile. You’ll find the music is world-class, and the hospitality is unsurpassed. This year, give your loved ones a different kind of family vacation: a treasure hunt in Texas’ Hill Country. No matter the season, the treasure is topaz. Found in Texas only in the Hill Country’s Mason County area, approximately an hour’s drive from Fredericksburg, topaz is a favorite for jewelry. The best stones are usually found close to the surface near the area’s Precambrian granite outcroppings in ditches and creek beds. Although blue topaz is the state gemstone of Texas, naturally occurring blue topaz is rare. Most of the topaz found here is clear, pale yellow, or gray. A favorite of ancient Greeks and Romans, topaz was once believed to cure lunacy. Today, the gemstone is considered a symbol of love and affection, and is said to promote a sweet disposition. Although topaz can be difficult to find, many folk’s searches in the area are rewarded regularly with some good-sized stones. You’ll need screens, a rake, a shovel, and some gloves for a day’s hunt. If you fail to find any topaz on your own, some Mason county jewelers/gemologists have a variety of stones available for purchase. Located in the heart of downtown, the Schreiner Mansion stands as a tribute to Kerrville’s proud heritage and rich culture. Built in 1878 by Charles Schreiner as a family home, it now serves exclusively as an historic community event center. Long admired for its singular architectural detailing, lovely antique furnishings, artifacts, and memorabilia, the mansion has become a preferred venue for weddings and other gala events. Schreiner was a Confederate Army veteran and a former Texas Ranger before becoming an entrepreneur with a budding mercantile business. Wildly successful, he soon found himself one of the most prosperous businessmen in the Southwest. As his wealth grew, Schreiner became a philanthropist, building structures and institutions to benefit Kerrville and the surrounding areas, and founding Schreiner University. The mansion is now operated by the Cailloux Foundation for all special event rentals, and up to two hours of complimentary photography is included with each event. For more information, call (830) 895-5222, or click here. The lone cowboy who sat tall in the saddle as he roamed the countryside became a folk hero throughout the entire country, but originated in Texas. Herds of cattle with almost no natural enemies thrived in the state, and their numbers exceeded five million by the end of the Civil War. For 20 years, from 1866 – 1886, cowboys were hired for the great cattle drives that took place on the open range. They were the heroes of their time, and have been lionized in hundreds of beloved western books and classic movies. The Museum of Western Art has always maintained a special bond with these quintessential icons of the Old West, through the museum’s exhibits of paintings and sculpture by living western artists, their art library, and their teaching facilities. Along with cowboys, the museum also features work depicting women, mountain men, Native Americans, the Texas Rangers, settlers, and other icons of the west. To learn more about the Museum of Western Art, click here. The effects of Hurricane Harvey have been devastating for folks in Texas and Louisiana, and many organizations and municipalities have received an overwhelming number of inquiries from companies and individuals who are eager to help out. If you’re looking to donate or volunteer, here are some options: First, the Hurricane Harvey Relief Fund is accepting donations. Houston Mayor Sylvester Turner and County Judge Ed Emmett established this fund to accept tax-deductible flood relief donations for victims affected by flooding. The fund will be housed at the Greater Houston Community Foundation, a 501(c)(3) public charity. To donate, or for more information, click here. Also, the Houston Humane Society has not forgotten our animal friends – some are strays, others are pets who have been displaced, and many are still at risk. The Society needs monetary donations, and are currently accepting donations online. You can also make a donation as a gift, which would be a fabulous way to give compassionate gifts for friends and family, in addition to making short work of your holiday shopping list. To donate, or for more information, click here. The National Museum of the Pacific War will host Drawn to War: Propaganda Art in WWII through Monday, August 14th. A strong influence on both troops and civilians, propaganda was widely used by both the Allies and the Axis for a variety of purposes. Posters, comics, cartoons, and newspaper articles were some of the media used to elicit the desired responses, and many examples of these are shown in this exhibit, courtesy of the Gregg and Michelle Philipson Collection and Archive. Many of the Philipson family members were lost in the Holocaust, and this collection represents their desire to honor those who died, and to share this historic collection with the public. The exhibit includes two original Walt Disney Comics, along with other Disney items displayed. Political cartoons by the beloved children’s author Dr. Suess, who was also an illustrator for the U.S. War Department, is included, along with work by anti-Nazi and anti-Axis cartoonist Arthur Szyk. The exhibit is now on display in the Temporary Gallery, and is free to the public. For details, call (830) 997-8600, or click here. This Independence Day, the air will be filled with the smell of hot dogs and hamburgers sizzling on grills, blaring horns and crashing cymbals will accompany bands marching to the sounds of Sousa, and a dazzling array of fireworks will illuminate night skies nationwide as we come together to celebrate our most American holiday. Guests of the Inn of the Hills are invited to come early and stay for the holiday to join in the fun and family-friendly events and activities listed below. On July 1st, the 19th Annual July Open Car Show will be held at the Kerr County Courthouse Grounds on Main Street. From 8:00 a.m. - 4:00 p.m., a variety of vintage trucks, cars, and motorcycles will be displayed. Food trucks will provide eats, and the Time Bandits will be performing. Proceeds will benefit the Senior Nutrition Services at the Dietert Center and the Educational Programs of Kerrville Morning Rotary Club. On July 4th, the City of Kerrville will host it’s 4th of July on the River in downtown Kerrville. This day-long celebration will feature Robert Earl Keen and Special Guests, along with “the largest fireworks display in the Hill Country,” beginning at 9:00 p.m. This year, forget the ties and the campy boxers, and give Dad something he really wants – a Texas Hill Country fishing getaway. We offer some of the best fishing in the state, along with some pretty spectacular scenery. Both the Guadalupe and the Llano Rivers are nearby, and offers kayaking and tubing for the rest of the family. The Guadalupe is stocked year-round by Texas Parks and Wildlife with freshwater trout, and every fall and winter with rainbow and brown trout below Canyon Lake Dam. Rio Grande Perch and Guadalupe Bass also make their home here, and the river is safe for wading. Just below the dam, Guadalupe Park offers free public fishing. Both the North and South Llano Rivers yield some good catches, particularly at the South Llano River State Park. Dad can wade out and fly fish, or fish from the bank or a kayak. The Llano River is home to Guadalupe Bass, Largemouth Bass, Catfish, and Perch. No matter the river, Dad is sure to find the fishing here both challenging and rewarding. 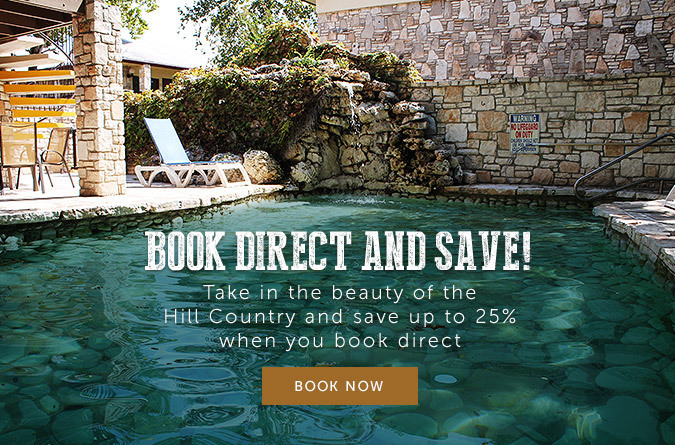 To book your Hill Country getaway, email: reservations@innofthehills.com, or visit: https://www.innofthehills.com/, or call (800) 292-5690. Set in the Texas Hill country near a bend in the Guadalupe River is one of the most unlikely sights you’ll ever come across: an almost exact replica of Stonehenge known as Stonehenge II. Set between two replicas of the heads of Easter Island, Stonehenge II is only 90 percent of the height, and 60 percent of the width of the original, and is constructed from steel and concrete. Built as an art project more than 20 years ago, Stonehenge II was constructed by Doug Hill and the late Al Shepperd. Shepperd was a Hill Country Arts Foundation patron, and added the Easter Island replicas after the nine months it took to build Stonehenge II. After Shepperd’s death, the monument was relocated to its current location on land owned by the Hill Country Arts Foundation. Stonehenge II has been visited by thousands of tourists, both in its original and current location, and is free and open to the public from dawn until nightfall. For details, large group permissions, or more information, call (830) 367-5121. It was March of 1847, and the German Settlers of Gillespie County had just signed a peace treaty with the Comanche Indian tribe. The Comanches celebrated by setting large signal fires all around the surrounding hills of Fredericksburg, inadvertently scaring some of the townsfolk’s little ones. One creative mother soothed their fears by telling them the smoke was from the dye-pots of the Easter Bunny, who was busily dying eggs for the children to find in the morning. This young mother’s tale quickly spread among other children and adults, and eventually became legend. Settlers continued to light the fires to mark the anniversary of the peace treaty, which carries the distinction of being the only treaty in the U.S. to be honored without violation by either party. The tradition continues to this day, when the town of Fredericksburg honors both their German ancestors and their cultural traditions by lighting the Easter fires on Easter Eve of each year. 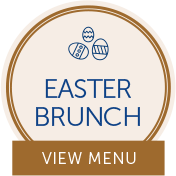 To see the Easter Fires and experience more April events in Texas’ Hill country, book your reservation now. Call us at (830) 217-3397, toll free at (800) 292-5690, or visit: reservations@innofthehills.com. This March, you won’t need a pot of gold to celebrate with the special rates and packages at Inn of the Hills. With so much to see and do in Kerrville and the surrounding areas, why not treat the family to a spring break getaway? Treat the family to a fun and relaxing one-night-only staycation. Check in and get a guest room with two queen beds and a full breakfast buffet for two adults and two children. You’ll save even more when you book early. Reservations made 14 days in advance save 15% off our Standard Daily Rate, and those made 30 days ahead save 20%! If you book a two-night stay, you’ll save up to 20% on your entire reservation. Book a three-night stay and save up to 30%. Free parking and free WiFi are always available for your convenience. For details and reservations, call (830) 217-3397 or (800) 292-5690, or email: reservations@innofthehills.com. On Saturday, February 11, get ready to wrap your arms around your sweetie, and lots of other folks as well, when you kick up your heels at the 42nd Annual Hug-In and Valentine’s Ball. Held at the world-famous Luckenbach Dance Hall, the ball will feature Texas music legend Gary P. Nunn, along with The Powell Brothers. A native of Oklahoma, Nunn adopted Texas as his home state not long after his family moved to Brownfield. Soon afterward, he started his first band, and honed his skills until he moved to Austin in 1967. He became a force of the progressive country music movement, and played bass for such country icons as Willie Nelson, and Jerry Jeff Walker. The Valentine’s Ball will be held from 9:00-11:45 p.m., and the doors will open at 8:00 p.m.
Perched high atop the Guadalupe River Valley, Kerrville Hills Winery has been producing award-winning wines since 2008. Built on a Kerrville homestead that burned in 2004, the tasting room contains many reclaimed materials from the original home, including a rustic and imposing double-sided brick fireplace. An impressive assortment of wines are available for tasting - Merlots, Cabernet Sauvignons (including a special selection for making spiced wine and Sangria), Petite Sirahs, Dessert Wine, Sauvignon Blancs, Muscats, and Pooch Montepulciano. They can be purchased by the glass, bottle, or the case, and windows in the tasting room provide views of the tank room and winery activities while you sip.